This year's surprise Easter treat. I saw these at Angry Chicken and thought they'd be great for us since they're so easy and we just happened to have a bunch of Shredded Wheat cereal and chocolate chips around. 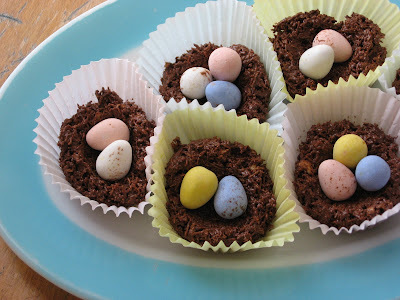 I made ours in baking cups, to keep the size relatively small and to help form the nest, and topped them with Cadbury Mini Eggs. They firmed up quickly in the fridge. If you eat as much shredded wheat as we did this week, you don't even have to crush it up, just use the huge amount of crumbs at the bottom of the bags. Below are last year's nests. 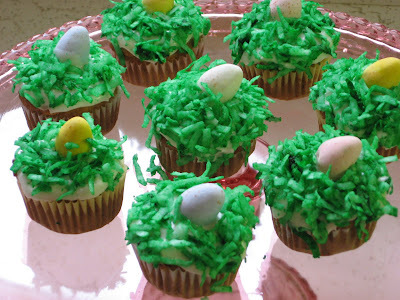 Rather, coconut-grass-topped cupcakes. Carrot cake, of course. 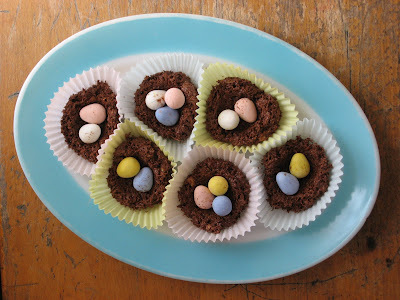 My daughter's birthday is so close to Easter, these were actually her birthday treats. We dyed eggs at her little party, too. This year, a pinata is on the menu. More to come on that in a couple weeks! Lovely, lovely! Sorry I missed helping with those; I might have had to have a taste. The nests are awesome. Maybe you can recycle the idea next month for your Earth Day party. Nicely done! How did they taste? They were good, but...as often happens, I ended up making changes to accommodate our pantry. Our nests were made with 3 different kinds of shredded wheat crumbs (some with cinnamon or honey flavoring) and 2 different kinds of chips (semisweet and butterscotch)-neither being the kind called for in the recipe. Milk chocolate would probably taste better and so would the plain shredded wheat. Unless you like the Mexican-inspired cinnamon-chocolate taste. I guess this post was really more about the picture than the taste, huh? Whew! That was a long explanation.